WASHINGTON (AP) — Special counsel Robert Mueller found no evidence President Trump’s campaign ‘‘conspired or coordinated’’ with Russia to influence the 2016 presidential election but reached no conclusion on whether Trump obstructed justice. That brought a hearty claim of vindication from Trump but set the stage for new rounds of political and legal fighting. Trump cheered the Sunday outcome but also laid bare his resentment after two years of investigations that have shadowed his administration. ‘‘It’s a shame that our country has had to go through this. To be honest, it’s a shame that your president has had to go through this,’’ he said. Trump said Monday afternoon that the release of the Mueller report “wouldn’t bother me at all,” and said: “We can never let this happen to another president again.’’ Trump, who made the comments during a meeting with Israeli Prime Minister Benjamin Netanyahu, said he thought Mueller acted honorably. 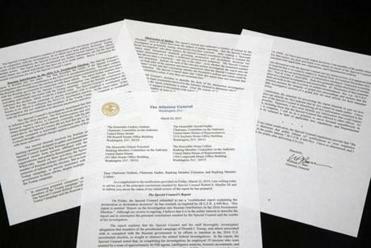 ‘‘Attorney General Barr’s letter raises as many questions as it answers,’’ House Speaker Nancy Pelosi and Senate Minority Leader Chuck Schumer said in a statement. ‘‘Given Mr. Barr’s public record of bias against the special counsel’s inquiry, he is not a neutral observer and is not in a position to make objective determinations about the report,’’ they said. Trump’s own claim of complete exoneration ‘‘directly contradicts the words of Mr. Mueller and is not to be taken with any degree of credibility,’’ they added. That’s a likely reference not only to a June 2016 Trump Tower meeting at which Donald Trump. Jr. expected to receive damaging information on Clinton from a Kremlin-connected lawyer, as well as a conversation in London months earlier at which Trump campaign aide George Papadopoulos was told Russia had ‘‘dirt’’ on Clinton in the form of thousands of stolen emails. Barr said that Mueller ‘‘thoroughly’’ investigated the question of whether the Trump campaign coordinated with Russia’s election interference, issuing more than 2,800 subpoenas, obtaining nearly 500 search warrants and interviewing 500 witnesses. Trump answered some questions in writing, but refused to be interviewed in person by the Mueller team. Barr said Mueller also catalogued the president’s actions including ‘‘many’’ that took place in ‘‘public view,’’ a possible nod to Trump’s public attacks on investigators and witnesses.